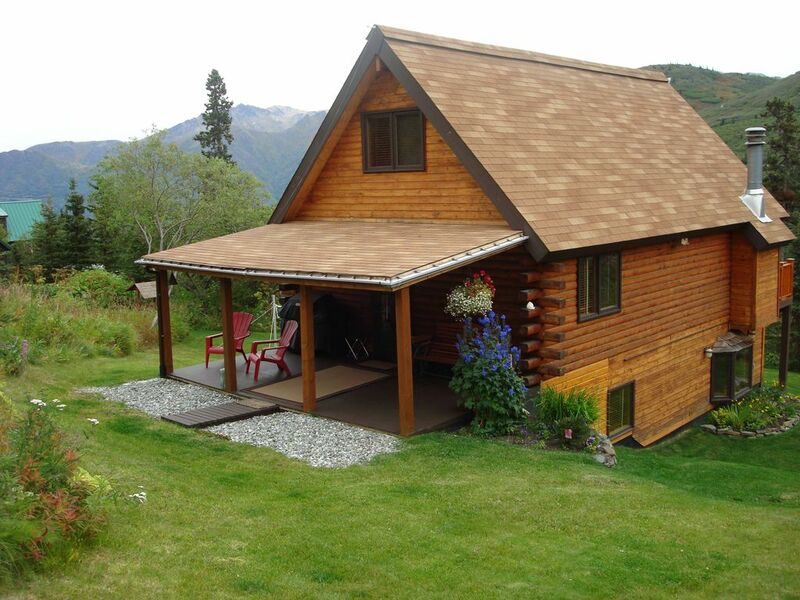 COME TO ALASKA and enjoy your long awaited Alaskan vacation in a spectacular setting nestled in among the 3,000-7,000' Chugach Mountains. View the wildlife from the front deck and experience the peace and solitude this property has to offer. The chalet sits on the side of a mountain and you may never want to leave. But if you do, just travel six miles down the mountain to Eagle River where you will find shopping and groceries. There, you can access the Glenn Highway and in just ten miles arrive in the city of Anchorage. This is truly a unique location. Travel from the mountain chalet to the city of Anchorage and places beyond. This is a great location for daytripping. There is so much to do and see. In state residents who have business, medical, or other needs that bring them iinto Anchorage will find a relaxing, comfortable place to unwind and relax after a tiring day. The fresh air and scenery will take the stress away in short order. It is a short ride to escape the hustle and bustle of your day. Although we do not yet have a cartop carrier, there is a 16' aluminum canoe available for your use. SO COME SPEND SOME TIME IN ALASKA - EVERYONE SHOULD VISIT AT LEAST ONCE! quiet residential area with mountain views from every window..
MY WIFE AND I PURCHASED THIS LOT IN '79'. THE HOUSE WAS BUILT THE FOLLOWING YEAR. IT WAS TRUE WILDERNESS BACK IN THOSE DAYS, BUT HAS BECOME MORE SETTLED OVER THE YEARS WITH THE ADVENT OF PAVEMENT, NATURAL GAS, AND ROAD MAINTENACE. THE AREA HAS REMAINED RURAL WITH LARGE LOT SIZES KEEPING IT OPEN AND APPEALING TO WILDLIFE. ENJOY ALL 3 DECKS, 2 COVERED, NEW OVERSIZE CHARBROIL BBQ, BADMITTIN, WILDLIFE VIEWING FROM THE HOUSE INCLUDE MOOSE, BEAR, WOLVES, SHEEP,GOATS,LYNX. GREAT HIKING AREA, MAJOR TRAILHEAD INTO CHUGACH STATE PARK IS 2 MILES AWAY. BACKPACKS PROVIDED. 17 MILES FROM DOWN TOWN ANCHORAGE, 7 MILES FROM EAGLE RIVER. PAVED ROAD TO HOUSE, 4WD VEHICLE STRONGLY SUGGESTED IN WINTER MONTHS. SELECTION OF MOVIES ON VHS AND DVD. SELECTION OF BOOKS AND BOARD GAMES. THIS IS A QUIET RESIDENTIAL AREA NO PARTY ANIMALS PLEASE. WE HAVE GOOD NEIGHBORS AND WANT TO KEEP IT THAT WAY. We stayed here our last few days in Alaska. The views were amazing! Cabin is in a nice quiet area. It had everything we needed to be more than comfortable. John was very responsive to any questions we had and made our experience very enjoyable. If I ever make it back to the area I would love to stay here in the summer! Absolutely beautiful, well taken care of rental. The location is outstanding. John was awesome! We arrived at around 3 am in the morning and found access available to the location. The house is beautiful and well maintained. There were moose and bear spotted the week before we arrived and we had hoped to see the same. We were out and about our entire time there and didn't arrive back to the house before nightfall so wildlife wasn't seen however the view of the surrounding area was astounding! We absolutely could not have chosen a more beautiful house and location. Snow capped mountains greeted us every morning. If I had the option to move to this location I'd chose this house for sure. John was so gracious with his communication and ideas for excursions. He was a please to work with and I hope to be able to return. If I do return it will undoubtedly be to this rental. Thank-you for the glowing review and for leaving the place spotless. Amazing Cabin Where Nature Comes Knocking At Your Back Door. We really enjoyed this Mountain Home. Everything was beautiful, clean and very comfortable. Conveniently located without being in the mess of daily traffic associated by big city neighbors, like Anchorage. From the view to the decor to the perfect location it exceeded our expectations. The views of the mountains from the deck are spectacular and the last morning was our most beautiful sunrise! We also appreciated the personal response from the owner John. He was so responsive and helpful in every way and it made all the difference. The most amazing part of this vacation was mother nature in all it's splendor. We had a bear with her baby cub wonder the property. We all got amazing pictures of momma bear but not junior because he hid behind the shed. 10-15 minutes later, a moose and her calf ran from the front porch to the back porch and up a well established game trail. Such a beautiful experience. Our last morning was blessed with the sighing of a white grayish wolf. I mentioned this to John and he stated he has only seen 1 other wolf in his 30 years of living there. I must admit, I feel truly blessed to have experienced such beauty. Highly recommend. us. Thanks for leaving the house in great shape. Just as advertised, the pics don't do this property justice, just gorgeous views from every window. across the valley and moose in the yard. A beautiful cabin in a serene mountain setting. Breathtaking mountain views all around. We especially enjoyed relaxing on the front and back decks while enjoying the views. Perfect for outdoor enthusiasts who enjoy hiking and seeing wildlife. Frequent bear and moose sightings across the valley and sometimes in the yard! Close enough to the Anchorage and Matsu Valley areas to enjoy a variety of activities. Well maintained, with all the amenities you could ask for. John and Ellen are excellent hosts and the love of their home shows in every aspect. see what adventures you've been up to lately as well as good tips on hiking spots. Always great having you and will look forward to your next summer's visit. If you want to be in the Anchorage/Wasilla area you MUST rent this house! It has 3 spacious bedrooms & 2 full bathrooms with gorgeous “Mountain View’s”. The owners have thought of every possible need you might have to make your stay like it was your own home. Extremely clean and welcoming. I just can’t say enough good things about this house! It was the best choice we made to rent this beautiful home! The owners were also so accommodating and wonderful to work with for our stay. Can’t wait to hopefully come back to it one day!! The best feature of our location is mountain scenery/ peace and quiet. Check-In time 8:00 A.M. Check-Out time 5:00 P.M.